wordpress | Rhymes with Rappahannock. Sorry if we’re looking a little bit flamboyant today. After blogging of some subjects, I thought it would be dandy to post one about the blogging engine itself, WordPress! So the first thought is really, “Why WordPress?” The answer is really it just works. I’ve tried blogger, and it doesn’t have any options. It is good for people who need a quick blog with no useful features. WordPress is bigger too, almost everyone who blogs uses it. It must be that crazy GPL licence again. WordPress has lots of options of stuff to change, but still manages to leave what people really need to do in the center of focus. It offers free blog hosting… ad-free 99.9% of the time! It is under constant active development IMO (I don’t watch wordpress much dev-wise) and it just looks nice in the end. If you want a blog, go to http://wordpress.com, sign up, and you have a golden blog like mine in seconds! I have been lazy, blogging is hardly a hobby of mine unless I have something interesting to post! and I like to keep my personal life online restricted to facebook only! But I haven’t left good ol’ wordpress yet! The blackberry storm leaks are starting to seem like they are coming FROM verizon. I might get a laptop. I’ve got the money! The alaska railroad sounds excessivly appealing to me. I want to take my senior trip on it. Windows 7 is starting to leak as well. Looks as if windows live is going to replace the terrible, terrible prebuilt microsoft programs. People might accually use windows 7 as vista is quite the failure. Well I did a quick update to the beta version and am even more impressed! The UI is much smoother and not so ugly. It still works well nonetheless, and I found the tags quicker. 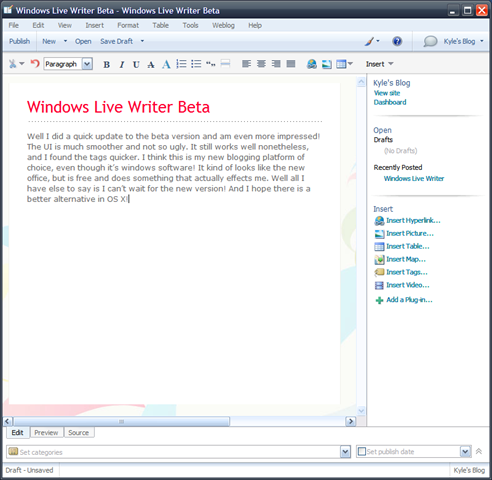 I think this is my new blogging platform of choice, even though it’s windows software! It kind of looks like the new office, but is free and does something that actually effects me. Well all I have else to say is I can’t wait for the new version! And I hope there is a better alternative in OS X! * Look at the nice picture! After 2 weeks now with this new Chrome browser, I am really enjoying myself with a lot of speed and confidence knowing that I am using a pretty advanced browser. I have been trying to keep up with wordpress lately and just have noticed the “turbo” link up in the top-right corner. I clicked it and now wordpress should be even faster :). If you are using chrome and wordpress, give the “TURBO” link a click!